Practical experience shows that nothing will so much insure immunity from drinking as intensive work with other alcoholics. It works when other activities fail. This is our twelfth suggestion: Carry this message to other alcoholics. When a man or a woman has a spiritual awakening, the most important meaning of it is that he has now become able to do, feel and believe that which he could not do before on his unaided strength and resources alone. He has been granted a gift which amounts to a new state of consciousness and being. He has been set on a path which tells him he is really going somewhere, that life is not a dead end, not something to be endured or mastered. In a very real sense he has been transformed, because he has laid hold of a source of strength which, in one way or another, he had hitherto denied himself. He finds himself in possession of a degree of honesty, tolerance, unselfishness, peace of mind, and love of which he had thought himself quite incapable. What he has received is a free gift, and yet usually, at least in some small part, he has made himself ready to receive it. We have learned a lot since we began using the Twelve Steps as our spiritual kindergarten. We have faced many painful realities about ourselves. We have learned to accept help and to tell the truth. We are now able to take responsibility for our actions and to stop blaming others for our deficiencies. Most significantly, we have discovered a Power greater than ourselves who loves us and who will restore us, care for us, change us, and guide us as we continue to turn our lives over to his care. Step Twelve is the last Step–but nothing is coming to an end. On the contrary, we will continue to practice these new principles for the rest of our lives. As we continue to grow in our conscious contact with God, we will find that we have more joy, peace, and serenity in our lives. 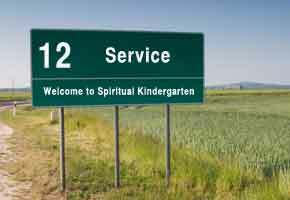 Remember that the Twelve Steps are a spiritual kindergarten–a way to begin our spiritual journey. If kindergarten can be this rich and rewarding, imagine what elementary school might be like! God is not done with us yet. The journey has just begun! The primary change that the Twelve Steps make possible is a spiritual awakening. Many of us have been asleep–spiritually asleep. Now we are waking up. We are more alert, and we can see some remarkable changes in our attitude and behavior. It is not important to define precisely when or how we have had a spiritual awakening, or even what words we could use to describe it. Our task is simply to acknowledge, with gratitude and humility, that we have experienced an awakening. We were asleep. Now we are waking up. The Apostle Paul used very similar language to describe what is needed: “The hour has come for you to wake up from your slumber….The night is nearly over; the day is almost here” (Romans 13:11, 12). It is good to be waking up! The spiritual awakening we are experiencing happens as the result of working the Steps. A spiritual awakening is not the same for everyone. It happens at different times and in different ways. But each Step invites us to greater awareness of God and greater surrender to God. Awakening from spiritual sleep is a long process for most of us. But it is a rewarding and exciting part of the journey. Carrying the message of our spiritual awakening to others is essential to our long-term health. Without sharing what we have received, we will be unable to keep what we have received. There is a lot of truth to the old slogan “You can only keep what you give away.” When we share the message of our spiritual awakening with others, we are witnessing to the reality of God’s healing power and to the way it has changed our lives. Jesus put it this way: “Let your light shine before men, that they may see your good deeds and praise your Father in heaven” (Matthew 5:16). Before carrying the message to others, we need to be comfortable with our own progress in working the Steps. If we do not see positive changes in our own behavior and are not practicing the principles of the Steps in our daily affairs, our message will not be effective. In A.A. they say, “You gotta walk the walk before you talk the talk.” If we don’t “walk like we talk,” what we share with others won’t have any credibility. Telling the truth with rigorous honesty is essential when sharing our story with others. Our message needs to be a sincere testimony of our own experience, strength, and hope. We will carry the message more effectively if we stay closely connected with our own story; we dare not forget where we were when we started on this journey! If we forget our own history, we run the risk of losing compassion and sympathy for those who listen to our story. We must remember that we once were suffering, just as others are suffering today. The principles of the Twelve Steps can be applied to every area of our lives. As we practice these principles in all our affairs, they will become an integral part of our lives. The important word here is “practice.” We need to do what needs to be done. The Apostle Paul made the same point about spiritual growth: “Whatever you have learned or received or heard from me, or seen in me–put it into practice” (Philippians 4:9). James makes the same point: “Do not merely listen to the word, and so deceive yourselves. Do what it says” (James 1:22).